It’s a day for bragging rights. Another proud parent shared information on a resident who deserves a shout out. 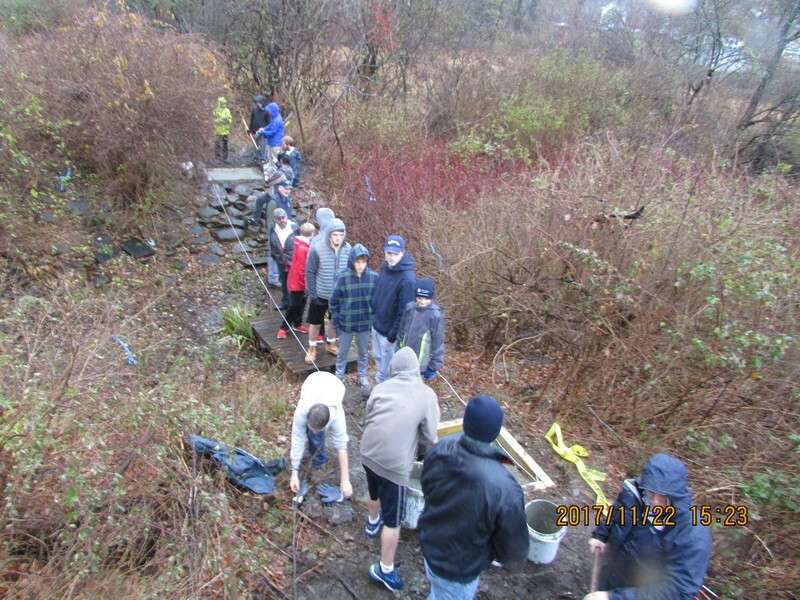 Our community has again benefited from the active scout programs in town. Earlier this month, I shared news about Troop 1’s Honor Court and how those scouts earned their wings by helping our community. Over the weekend, Troop 92 held its Honor Court. I previously posted about the projects completed by two of their members. 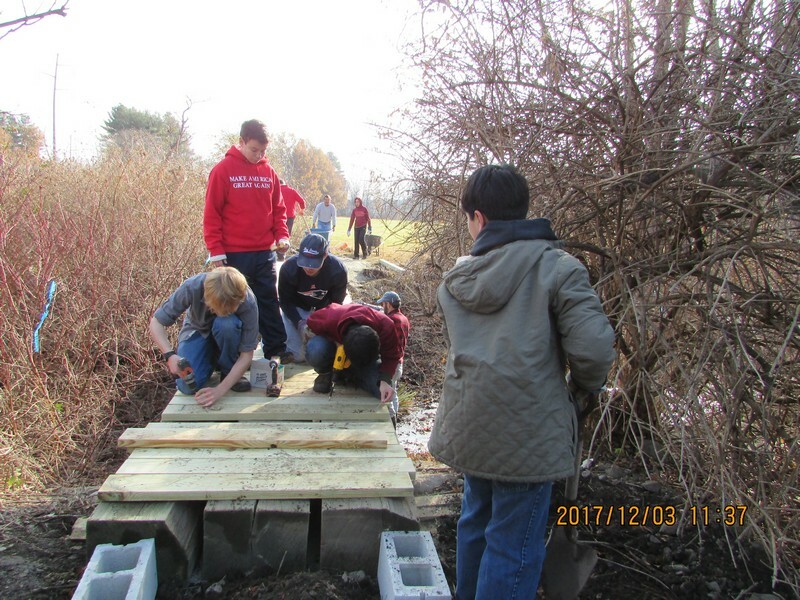 Recently, I learned about a third Troop 92 project worth sharing. 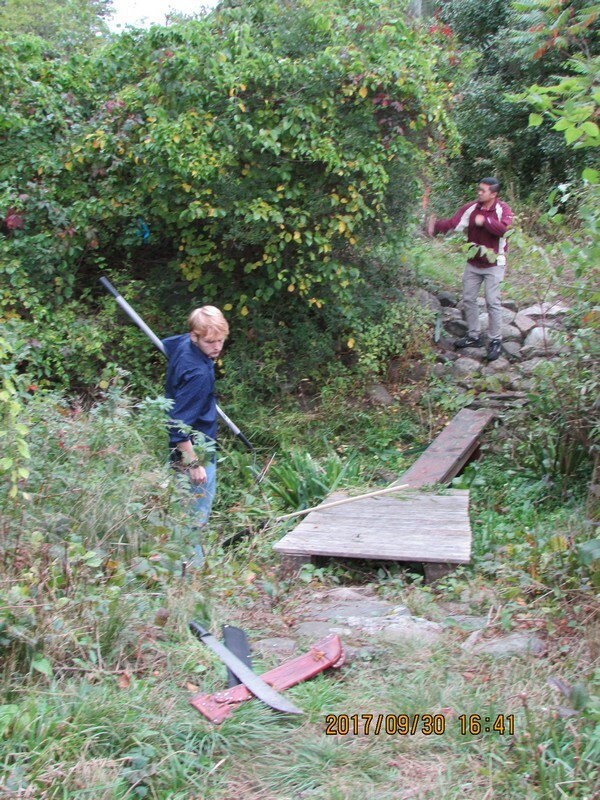 Nate Hall’s Eagle Scout project restored an old crossing for a scenic walking trail in town. A bridge across a stream on the Sudbury Reservoir Trail had collapsed. Hall led the effort to build a replacement. 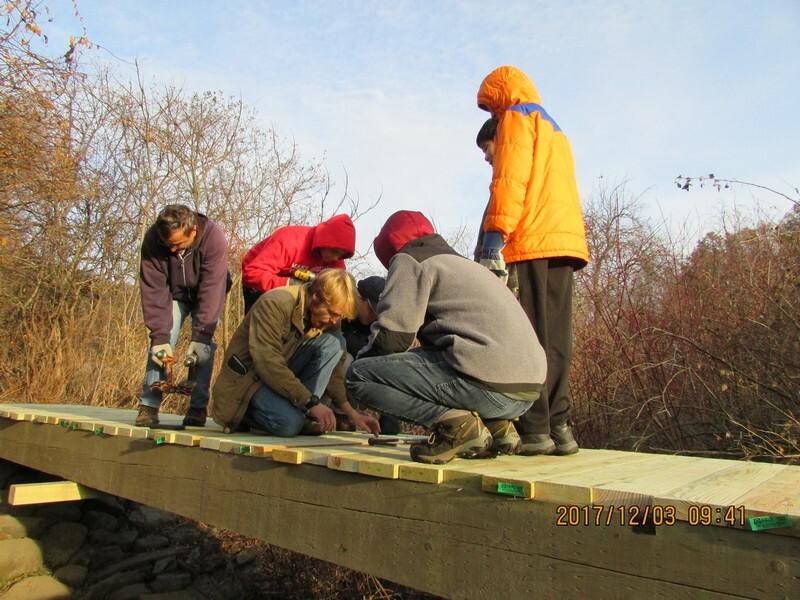 The project required coordinating with working with DCR, DOT, Trail Committee, Conservation Committee, plus local business for sponsorships. Judging by the pictures, it also required a lot of helping hands. 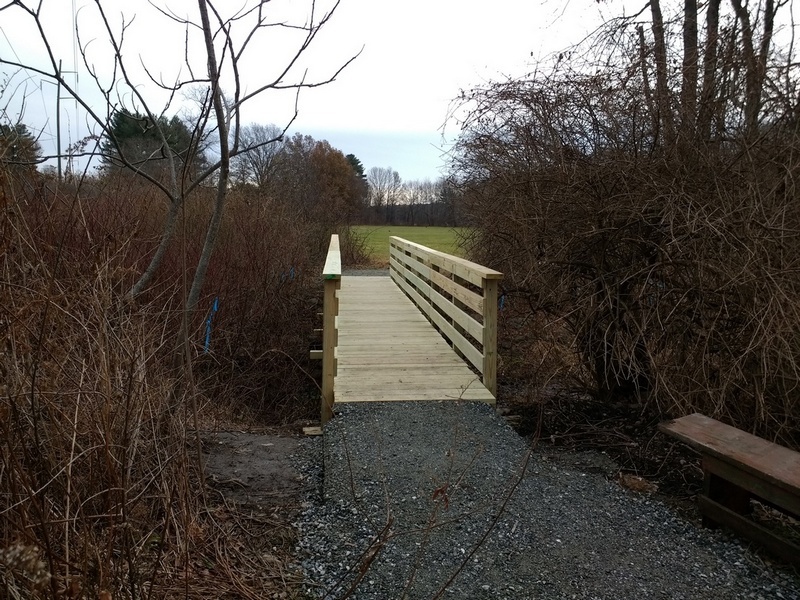 The bridge is on the trail behind by the behind Fay School, just off Middle Road. Here are more contributed photos. 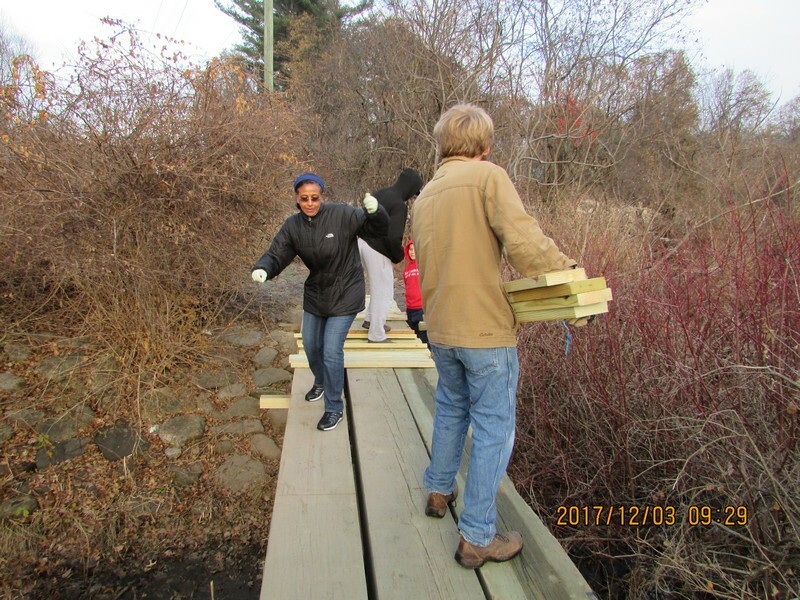 Click on thumbnails below to see Hall and volunteers in action. Southborough parents, don’t be shy. If your kids have earned bragging rights of their own, feel free to email your news and photos to mysouthborough.com. I was wondering who was responsible for this! Kudos to the members of Troop 92, who have made crossing this spot a whole lot easier for myself and my two dogs. We endured many precarious crossings in inclement weather because we love walking this trail. It’s a beautiful area to stop and enjoy the sights and sounds. The community will benefit for years to come, so thanks again. Many thanks. 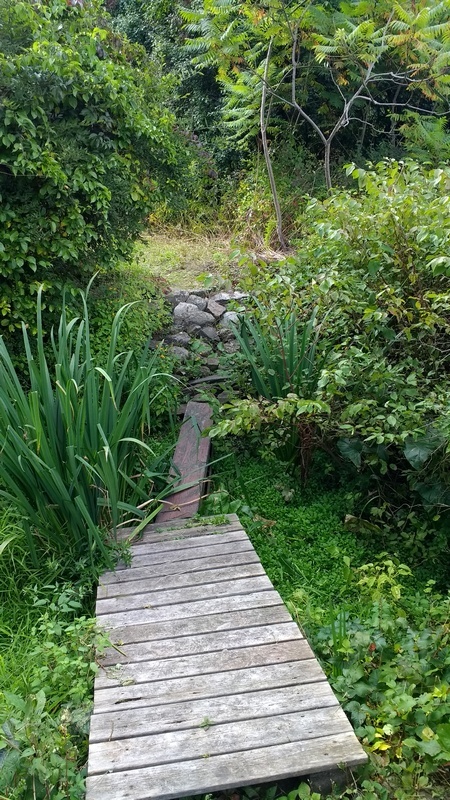 It is a wonderful trail, and the old , precarious plank bridge needed replacing. You have done a first class job. The remaining deterrents to hiking are the narrowness of some sections of pathway, where brush intrudes , and the poison ivy. David, maybe it’s time to bring in the goats to take care of those issues! poison ivy – LOTS of poison ivy in and along that trail just west of the new (well, it was replaced several months ago) footbridge! I used that part of the trail before spring 2018. After finding so much poison ivy growing there, as the weather warmed, I’ve stopped using that pathway. Hello Ivy! Today’s report: The pathway is clear of poison ivy just west of the bridge. There is a small patch near, but not on, the SE corner of the bridge. A hundred yards further west, a few trailers on the ground – not a threat since it is mowed there regularly. Identifying poison ivy is a self-defense skill set I have honed over more than seven decades. There is a quaint young spiral of bittersweet climbing a column of the railing. You can safely stand on the bridge and watch it grow. The Sudbury Reservoir Trail is a valuable asset for Southborough. Deerfoot to Cordaville Hall via the SRT, the footbridge and the cemetery is an easy 25 minutes. It’s on the list. I will unsheath my Felco #2 clippers next time through there. Easy enough when you have the right tools. It’s a FIRST CLASS bridge. Thanks to the scouts! Thank you for the trail maintenance! Nice clippers and much appreciated. Mark, my pleasure. Who engineered that bridge? It appears safe for a parade of elephants. Fun fact … the EAGLE SCOUT bridge is a four minute walk on the SRT from Middle Road, six minutes from Parkerville. Keep your distance from the bittersweet lest you get strangled in its embrace. Fun fact: Frederic P. Stearns, if he was still around, would likely approve the engineering of the Nat Hall Eagle Scout Bridge.